Mmmmmm.....guacamole is so yummy. You know, I used to think that the serpent convinced Eve to try an avocado, because it is the only fruit that could be that tempting. However, I realize now that it couldn't have been an avocado. You know why? Because avocados don't ripen on the tree. 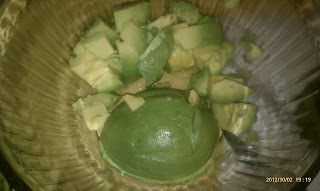 And if you've ever had an under ripe avocado, you know that it is anything but tempting. 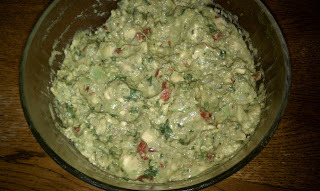 In fact, using ripe avocados is the trickiest part of making guacamole. It's quite easy to put together. But catching avocados at that perfect time when they are soft, buttery and at peak flavor, but not stringy and mushy from going overripe, is a challenge. 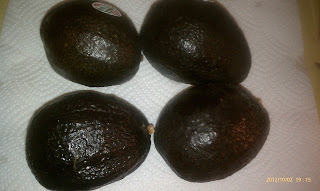 As I mentioned, though, I learned a couple of years ago that avocados don't ripen on the tree (Alton Brown told me so). That changed my whole perspective. See, I am a picky produce shopper. I am that woman who stares at the pile of tomatoes, picks them up, holds them away from the special lights that shine on the display that make them look more red than they are, squeezes them to see if they yield to light pressure.......yup, I am that woman. I have high standards for lettuce, limes, asparagus, garlic, you name it. So when I used to shop for avocados, I would look for a good, all-over brown color, something that would yield slightly to light pressure when I pressed my thumb (gently) into the flesh, but with no really soft spots, and heavy for its size. No more. Shopping for avocados is easy now. The only thing is, I have to plan ahead. Three to four days before I need them, I look for bright green, unblemished fruit that is very firm all around. I take them home and set them on my counter. If I am in a rush, I can put them in a paper bag with an apple or banana for a couple of days, and they will ripen a bit faster. Now, after they start to look brown, I apply the light pressure with my thumb. If it yields just a bit, I can tell that it is softened enough to use. So far, I've had pretty good luck with this method. However, if you have a sudden, unquenchable craving for guacamole and you don't have any ready on the counter, check at a Mexican market. Some of them carry a constant supply of avocados, and you'll have better luck finding some ripe ones there than at a regular grocery store. 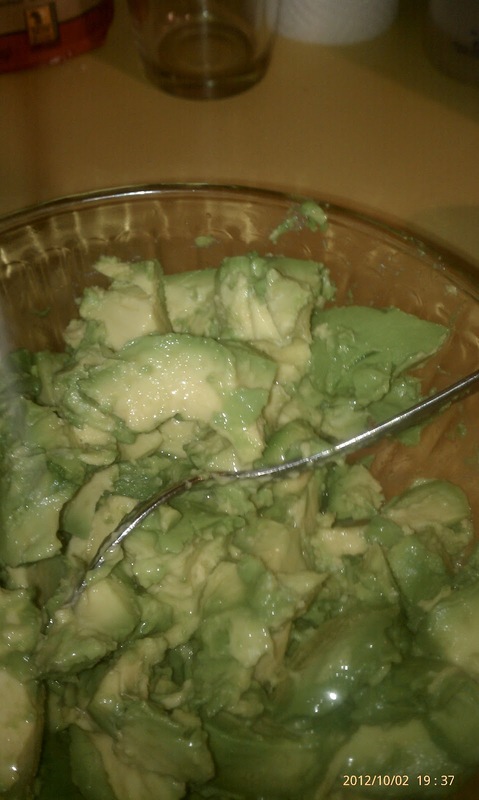 Trust me, if you've tried avocado before or after it was ripe, and didn't like it, you really need to try this. There is just nothing better than a soft, green-fleshed, buttery avocado. Limes. I love limes. I would keep a bowl full of them in my kitchen if I had any room to put the bowl or the time to make a mojito every night. My friends and I throw a little party for our kids' teachers every spring, and last May we had a Tex-Mex menu. I didn't realize until my friend Patty pointed it out, that there was lime in just about everything. The fajita marinade, the cilantro-lime rice, the pico de gallo, the guacamole, the salsa for chips, the mint-lime agua fresca....even the strawberry granita had a bit of lime juice in it. I really hope that nobody was averse to limes that night. But again, picking them out is the hard part. I once bought limes at Aldi because they were quite cheap. Problem was, I got maybe a teaspoon of juice out of each one. Not cool. I love Aldi to pieces, but I don't buy citrus fruit there anymore. Yeah, I hold a grudge. I have since learned the secret for finding the best, juiciest limes. I'm hesitant to publish this, though. Because I want to be able to find the good ones. I feel the need to share. But if you shop at the Meijer on Alpine....just leave a few good ones for me, okay? Here goes: Most days, there are loads of limes to choose from. There are often two different sizes. It doesn't really matter which one you buy. If you only need a tablespoon or so of juice, get the small ones. This rarely applies for me. I buy the big ones. They are usually about 5 for $2. Code 4048 if you use the self-checkout at Meijer. Did I mention that I love limes? So how do you choose the good ones from this enormous selection? There are three main things that I look for: Color, shape and skin. The lime on the left is pale and yellow. The one on the right is bright green. This really only matters if you are using the zest. It probably won't affect the juice. But since I often do use the zest, I zero in on the green. 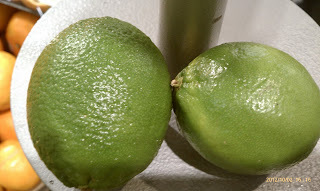 For juice, though, the lime on the right is still superior because of its shape. 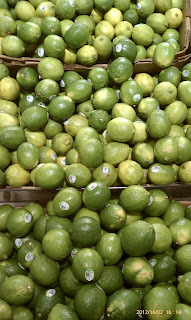 Round limes (and lemons, too) usually yield more juice than a more oblong lime. 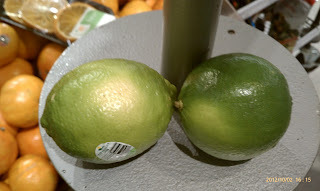 Again, the lime on the right will tend to be juicier than the one on the left. I can tell because of its skin. It's not quite as obvious in this picture, but the peel on the left is quite dimpled, whereas the one on the right is pretty smooth. Dimpled citrus peel tends to be thick, and thick peel means less pulp. Less pulp means less juice. 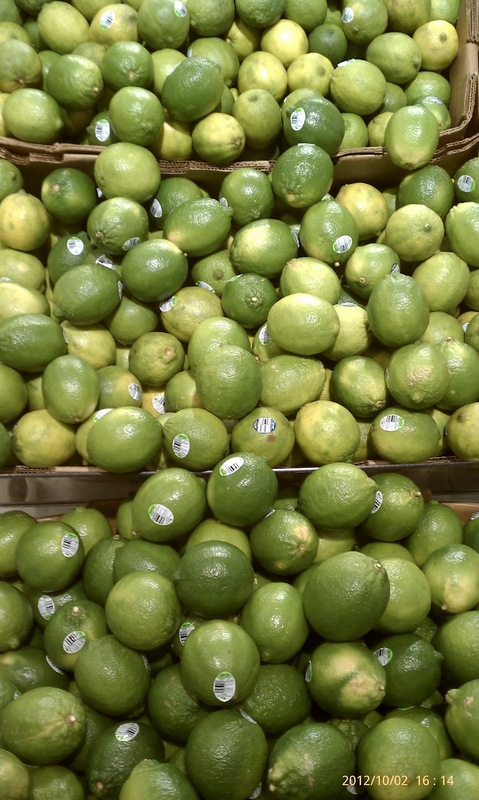 Go for the roundest, brightest green, smoothest limes you can find. And, as with pretty much all fruits, apply light pressure with your thumb. A rock hard lime won't yield as much juice as one that gives slightly. And to get the most juice out of citrus, roll it firmly against the countertop with your palm right before you cut it in half. This breaks up some of the pulp and makes your job of squeezing easier. Squeeze each half as much as you can, and then get your (very clean) thumbs up into the rind. Press, squeeze and massage until you can't get another drop out. I usually get nearly 1/4 cup of juice out of each lime. When a recipe calls for "1 cup of lime juice (6-8 limes)", I get a little thrill out of getting that much juice out of 5 limes. Yeah, I do realize what that says about me. 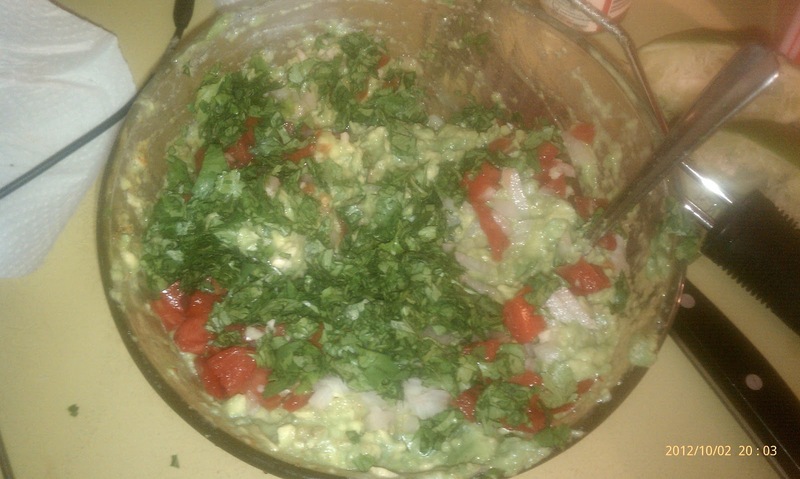 Alright, now that all the produce is chosen and the avocados have ripened on the countertop, let's make guacamole! Now get your four nicely ripened avocados ready. Slice through the avocado from the top, until your knife hits the pit in the center. The skin tends to be a bit leathery, so if your knife doesn't slip right in, use the tip to poke a small hole, and then slide the blade against that hole. You shouldn't have any more trouble with it. 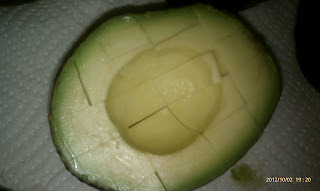 Once your knife blade hits the pit, turn the avocado around so that the knife continues around the pit. 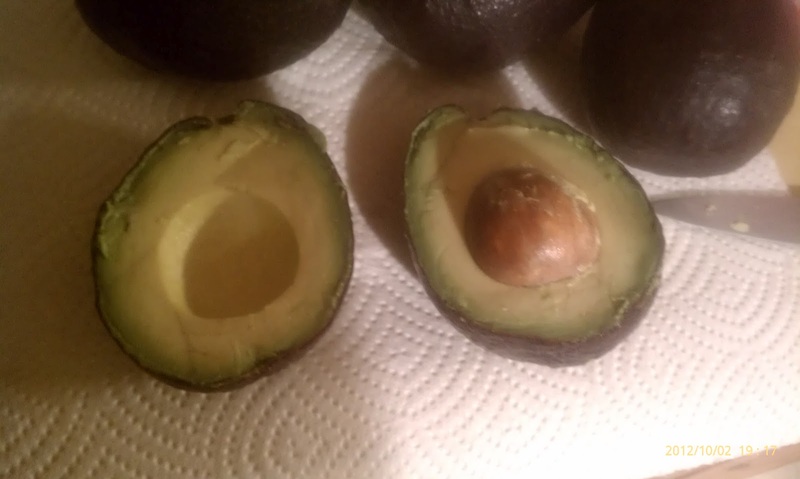 Once you get all the way around the avocado, you can twist the two halves to loosen one side from the pit, and then pull them apart. One side will keep the pit. To get it out, lightly tap the knife blade into the pit until it catches, then twist the knife and the pit will come right out. Be careful getting the pit off of the knife. It's slippery, and accidents can happen. Don't try to do this with your bare hands. Either use a pot holder or a folded up paper towel to grab the pit, and then pull the knife out. The towel will protect your hand. However, I prefer to take the avocado half out of the skin intact, either by scooping the entire half out with the spoon as above, or by peeling the skin away from the flesh. 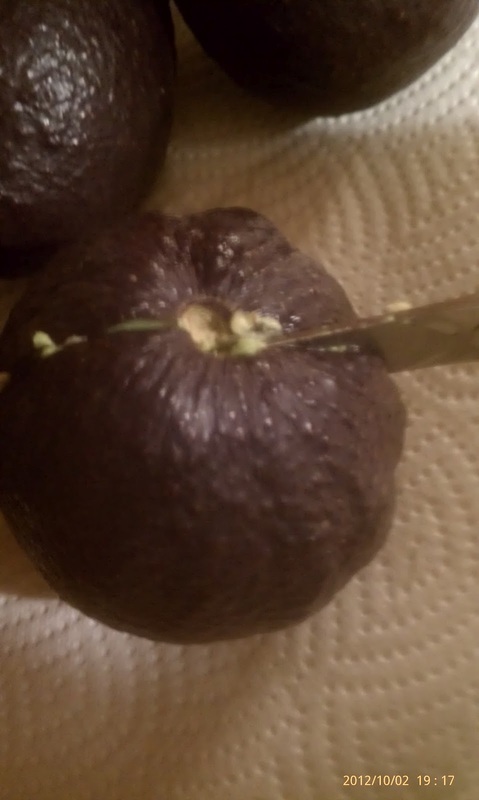 For one thing, I can more closely inspect the avocado for any yucky brown spots, and easily cut them away. For another, if I want diced avocado, I prefer to make a horizontal cut to make the pieces more uniform before dicing. 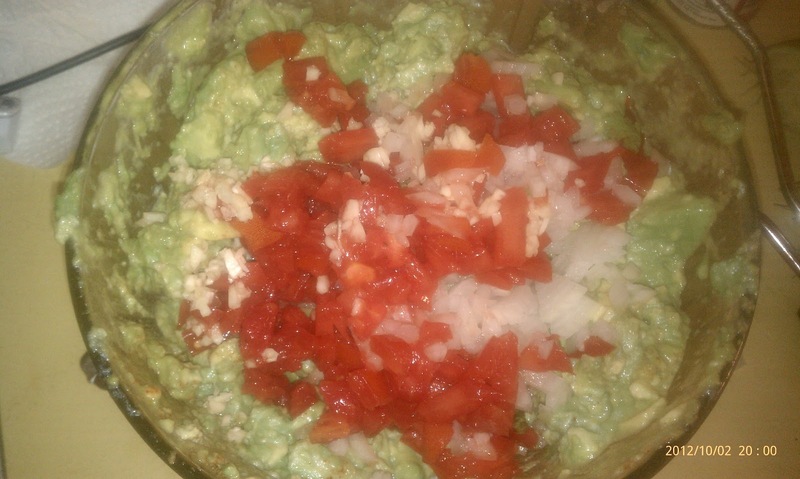 And in the case of guacamole, it is all going to be smashed anyway, so why bother dicing it? 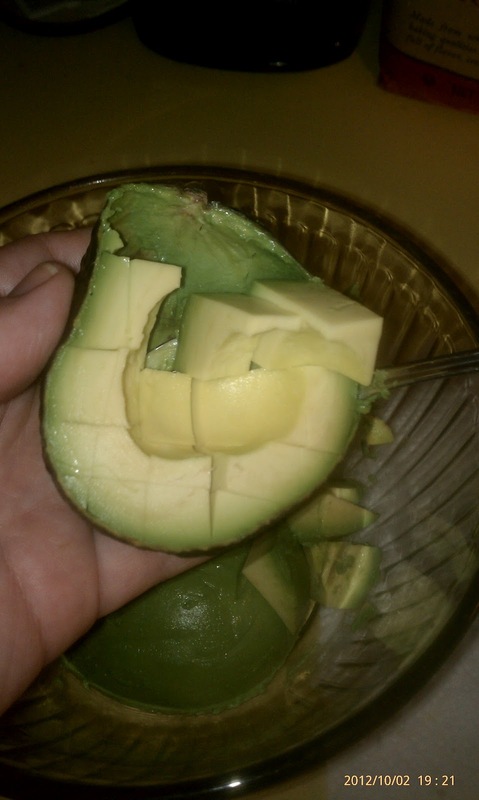 I just scoop the avocado half out into the bowl, and then use the side of the spoon to roughly cut the avocado into chunks. Now squeeze the juice of one lime all over the avocado chunks, and toss to coat. This not only adds flavor, but helps to delay the oxidation process that makes avocados that are exposed to the air turn brown. While the avocados rest in the lime juice, prep the rest of the ingredients. 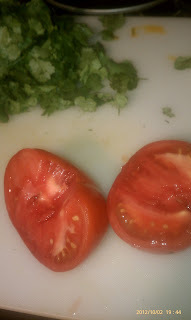 First, cut a tomato in half, remove the core, and scoop the seeds and out with your finger. The gel that surrounds the seeds will contribute a lot of moisture, and you don't want watery guacamole. It's best to just get rid of the stuff! 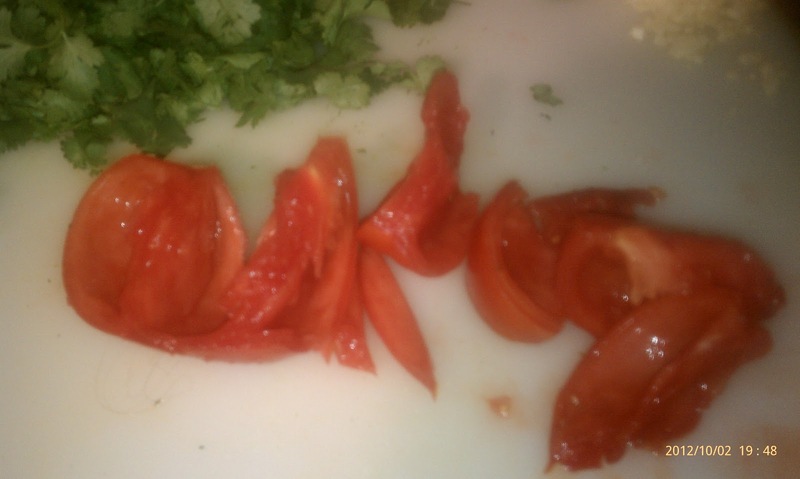 Then just chop the tomato into a small dice. Don't be too fussy about it, just keep in mind that this is being lifted by a tortilla chip, so you want the pieces pretty small. You will also need half of a small or a quarter of a large onion, finely diced, and a clove or two of garlic, minced. 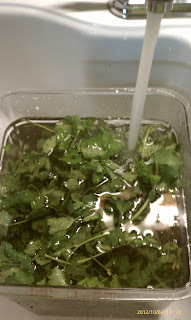 Get some cilantro leaves pulled off of the stems, too. I would say at least 1/4 cup, but I like way, way more. Like at least a cup full of leaves, unpacked. But don't mince them until you are ready to mix them in. They tend to take on a soapy flavor once minced and exposed to the air. Now it's time to season the guacamole. Use about 3/4 tsp each of course Kosher salt and ground cumin, and about 1/2 tsp of ground cayenne pepper. 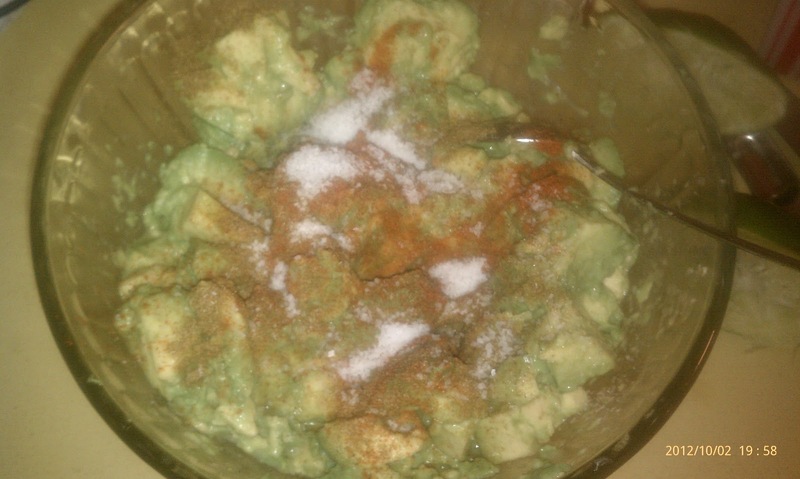 I prefer cayenne pepper to minced jalepeno in guacamole. 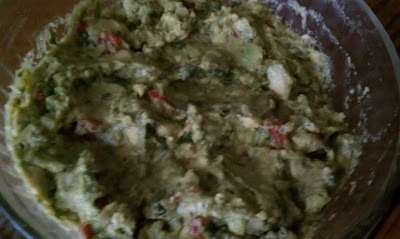 I think it adds heat and flavor, while jalepeno can add an unpleasant hit of heat that just feels off amongst the creaminess of the guacamole. Personal preference, though. You could certainly substitute minced jalepeno for the cayenne. Time to mash it up. Some recipes suggest using two knives, which leaves you with a very chunky guacamole. Others suggest using a fork, which tends to get very smooth, and takes forever. I like it somewhere in between, and I find that using a potato masher gives me a good creamy texture with a few pleasant chunks, and it takes only a few seconds to get there. And finally, the cilantro. Stir it all in well. 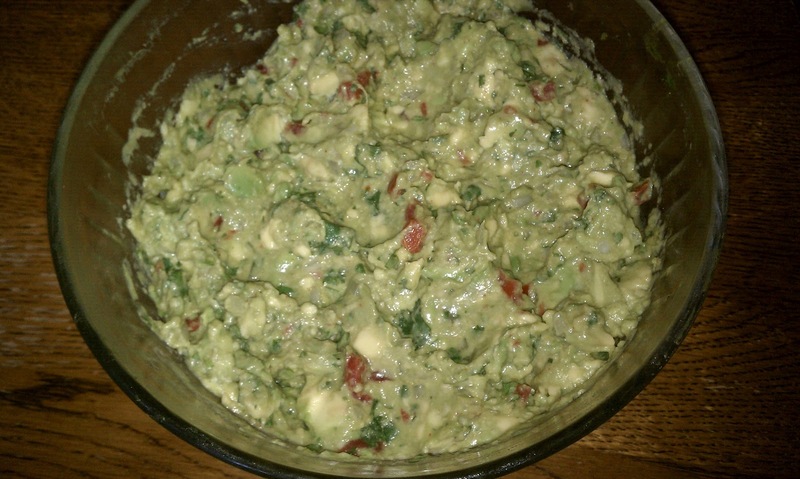 Finally, and this is important, taste the guacamole. Don't taste it with a spoon, because that's probably not how you are going to serve it. Taste it with a chip. 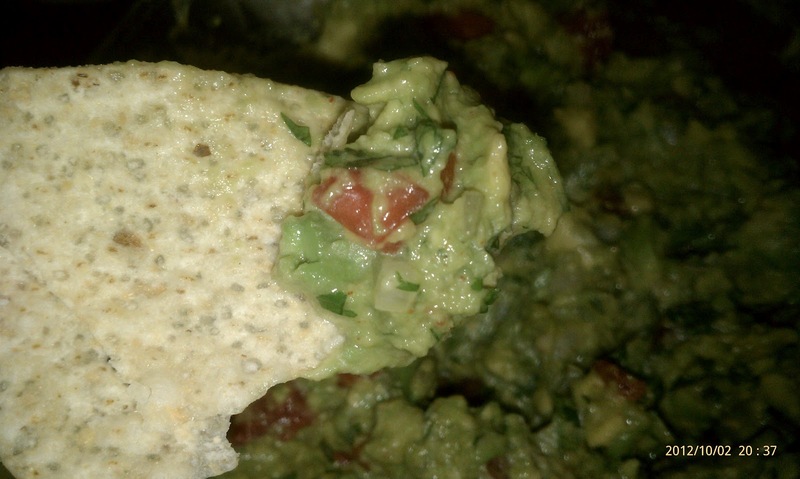 Chips are salty, so you want to see how the guacamole tastes with the salt on the chip. Otherwise, you may add salt and find that it is too salty with the chips. At this point, I usually add more lime juice or cilantro. Again, if you are using the lime-flavored chips, more lime may not be needed, so taste it the way you'll serve it! Finally, to avoid oxidation before serving or while storing leftover guacamole, smooth out the surface of the guacamole with the back side of a spoon, and then lay a piece of plastic wrap over the bowl. Lift the edge of the plastic wrap with one hand, and press it down to the center of the surface of the guacamole with the other hand. 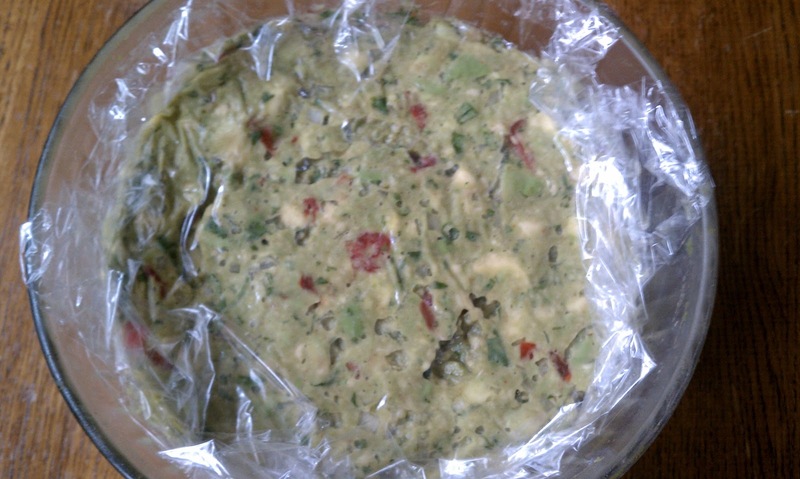 Slide your fingers along the surface of the guacamole, all the way to the edge of the bowl, to adhere the plastic wrap to the surface. Turn the bowl and repeat until the entire surface has been "coated" with plastic wrap, and the wrap is adhered to the inside of the bowl. This blocks out the air quite thoroughly, and you won't end up with brown guacamole when you pull it out in a couple of days. My frugal side compels me to tell you that there is really nothing wrong with browned guacamole. For one thing, only the surface will brown. 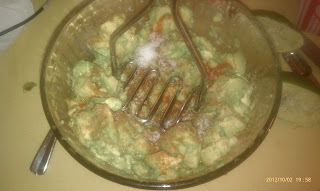 If it bothers you, you can scrape it off to reveal still-green guacamole underneath. If you have a stronger constitution than I, you can also just stir it in, and the brown will all but disappear. So if you didn't have any plastic wrap, or if you didn't quite seal all of the air out, no worries. 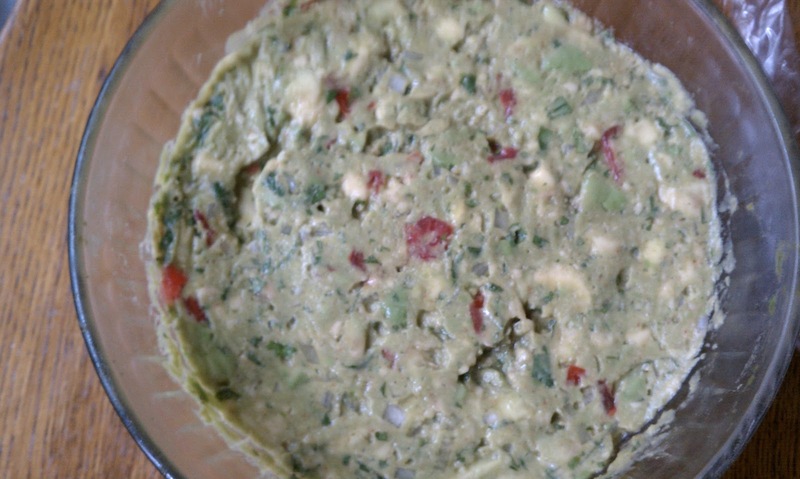 Don't toss the guacamole. However, a good seal as described above is the best option. This guacamole has been refrigerated for two days, and it looks just like it did when I put it away. Katy, THANK YOU for your recipe! 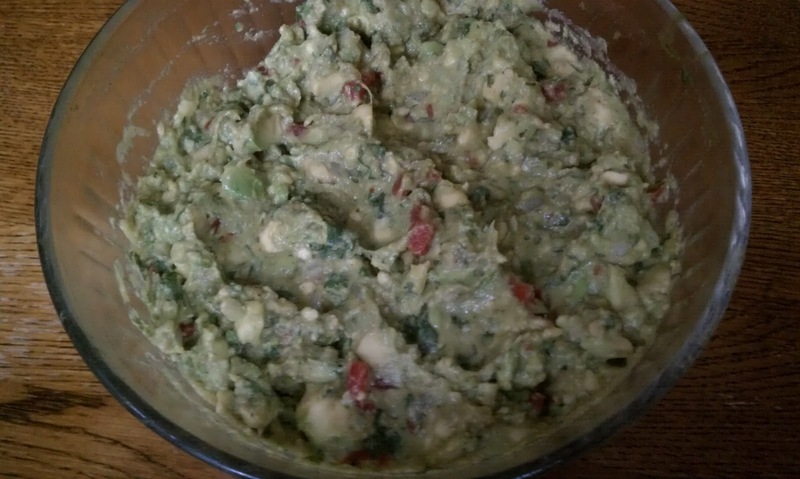 I have tried to make guac a few times here, and it NEVER is as good as yours. I love all your tips too. I'm excited to cut up some onion soon. Oh, and I did try cutting onion with my mouth shut, and four times in a row I haven't cried... and I always cry!